Sunday, April 21, 2019, Genoa, Italy. Saturday, April 20, 2019, Genoa, Italy. 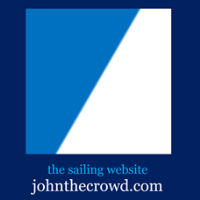 April 19, 2019: three classes are in Medal Race action at Hempel World Cup Series Genoa on Saturday, while everyone else has one day of fleet racing left! Check out how the Laser Radials, Finns and 470 Men & Women are getting on ahead of their medal showdown on Sunday. World Sailing TV video published Apr 18, 2019: Seven out of eight classes raced on Day 4 of the Hempel World Cup Series in Genoa...here are the best bits from the Laser, 49er, Finn and Nacra 17 fleets. See also Day 3 and Day 2 highlights of the Hempel World Cup Series Genoa 2019. Events: Men 470, Women 470, Men 49er, Women 49erFX, Men Finn, Men Laser, Women Laser Radial, Mixed Nacra 17.